Tom Bradley International Terminal at Los Angeles International Airport. "Travelers are discovering that LAX is reaching new heights as we progress toward our goal of gold standard airports," said Deborah Flint, Chief Executive Officer, Los Angeles World Airports. "From an efficient check-in and security experience, to our fast and free Wi-Fi, to incredible choices for shopping and dining, and even our surprise and delight events, we are working to provide unforgettable experiences for everyone who travels through our airport." 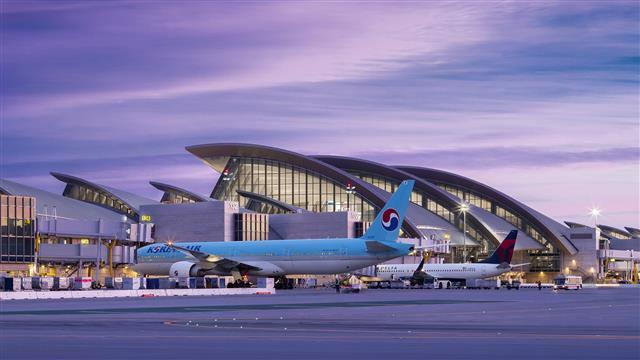 According to Skytrax World Airports Awards, LAX is now ranked No. 71 among the world's top 100 airports, up from No. 72 last year. LAX also ranked No. 8 among U.S. airports in the passenger-based surveys, as well as No. 8 among the world's airports serving more than 70 million passengers each year. LAX has continued to climb the Skytrax rankings, jumping 27 spots in the world ranking and five spots in the U.S. rankings since 2015. The survey shows passenger approval continues to grow as the airport invests in modernizing its facilities. The Skytrax's world airport survey evaluates travelers' experiences in the following areas: check-in, shopping, arrivals, transfers and security through departure at passenger gates. Skytrax covers more than 500 airports in their annual survey, and features the rankings for the top 100. Read the Skytrax rankings here. LAX was named the No. 5 best U.S. airport for business travelers among the 46 busiest domestic airports ranked by Fundera, a financial solutions company for small businesses. The rankings are based on factors that include flight delays, cancellations, lounges with Wi-Fi, proximity to downtown, parking rates and average hotel rates, using data from the Bureau of Transportation Statistics (BTS). According to the report, 82 percent of departures and 81 percent of arrivals at LAX were on time in 2018, with just 0.83 percent of flights cancelled. The report also took note of LAX's ample amenities for business travelers and other airport guests. "LAX has a whopping 22 lounges with Wi-Fi — with more than a dozen airlines represented — second only to New York’s John F. Kennedy Airport," according to the report, which also said LAX's economy parking is affordable, at just $12 per day. Read the complete list by Fundera here. LAX was also named the No. 13 best airport for on-time departures, customer experience, price and airport performance as ranked by Money Magazine. To determine the rankings, the magazine analyzed data for the 75 busiest airports in the U.S. Customer satisfaction ratings were considered for the following areas: ease of access to the airport, restaurants, shopping, airport design, check-in security, overall experience and the number of airlines served. Rankings were also determined based upon the percentage of on-time departures, average airfare price, departure delays, cancellations and the yearly changes for these metrics. Read the complete article in Money Magazine here. Guests can enjoy new shopping and dining choices across all nine terminals at LAX. Through a partnership between LAX, Southwest Airlines and Unibail-Rodamco-Westfield, the new Terminal 1 opened in November 2018 and includes 22 new dining and retail destinations, 12 local brands, and 14 LAX firsts. Some of the concessions include Cassell's Hamburgers, Urth Caffe and Trejo's Tacos. Throughout the year, guests are entertained in each terminal thanks to LAX Presents, a cultural performance series, hosted by LAX and Grand Performances, which runs from March until December. Now in its third year, LAX Presents will feature 38 performances and styles, including jazz piano, classical ensemble and vintage West Coast rock. The LAX Gold Star Awards Program allows guests and staff members to recognize LAX employees who go above and beyond to ensure that gold standard service is delivered. Guests can easily acknowledge employees who they believe deserve special recognition, by accessing an electronic form here. LAX guests are also encouraged to visit https://www.flylax.com/en/lax-guides-tips-and-amenities to get information needed to easily navigate the airport and enjoy their time while traveling to their destinations. 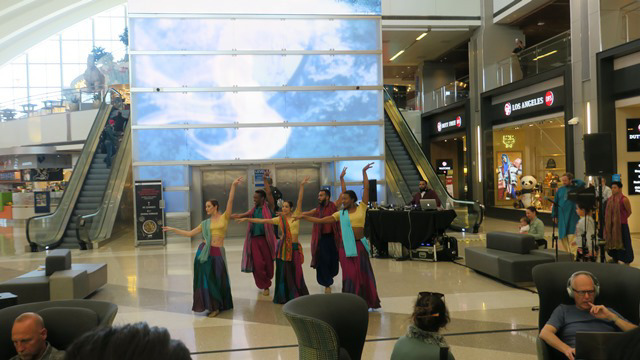 The Blue13 Dance Company performs in Tom Bradley International Terminal as part of the LAX Presents Series. 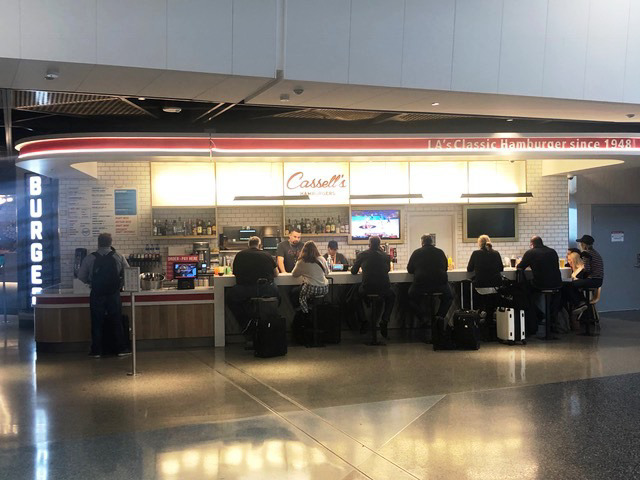 Cassell's Hamburgers in Terminal 1 at LAX is one of the new LA-based restaurants introduced as part of the terminal modernization. 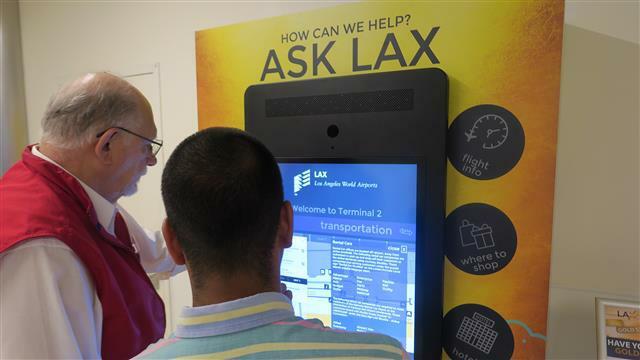 Ask LAX kiosks help guests navigate the airport.